The principal in this type of lubrication is that a' drop of lubricant is split by airflow. The fine droplet of lubricant is delivered to the outlet. Oil remains at the friction point, while air is free to escape into atmosphere. 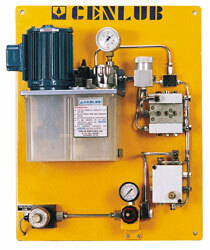 It is quite an opposite phenomenon as compared to air mist lubrication system. It is achieved with the help of high velocity of air and fine controlled flow of oil at the periphery of small restrictor and tube carrying droplets. OIL + Air lubrication system comprises of a motorised pump and a special metering unit which can adjust oil quantity ranging from 0.01 to 0.Ice per outlet, by suitably varying air flow into the metering unit, a required fine oil + air can be achieved. Pressure as well as monitoring of oil level is must with this system. High speed anti-friction bearing lubrication.